From the moment I first laid eyes on Eternity's Child I was expecting something special. An ambitious little title from artist Luc Bernard, the story concept captivated me just as much as the artwork. Flooded planet and mechanized animals aside, Eternity's Child was the simple story of a boy seeking acceptance in a world that had no place for him. Of course many things have changed since that initial story. Main character Angel found a winged girlfriend, the game was announced as a PC and WiiWare title, and a dual-character control system was revealed, but it was still the same concept I initially fell for, wasn't it? Will Angel find the acceptance he so desperately seeks, or should gamers turn a blind eye to his plight? Hit the jump and weigh his fate.Loved The Art Design: Luc Bernard's artwork for Eternity's Child is what drew me to the title in the first place, and it looks even better in motion. The animation purposefully mimics 2D marionette movement to give the whole game a pop-up book sort of feel. The Music: Sean Beeson's score for the game would be completely at home in one of the more whimsical Tim Burton films. Hard to believe this much work went into such a tiny game. The Price: The game only costs $4.99 via Steam, for which you get the 20 levels that make up the first chapter and the promise of free addition chapters in the future. The Level Editor: Just an extra bit of fluff that lets you mess about with Bernard's artwork or add your own to comedic effect. Hated The Story, Or Lack Thereof: Bernard wrote a wonderful background for the story involving a dark future where the earth has been flooded, the wingless hunt down the winged out of revenge, and nature is slowly being overtaken by the mechanical, all of which is addressed in a scrolling text opening and then never really visited again. Such an intriguing story needs to be explored, not ignored. The Two-Character Mechanic: While it looks good on paper, having one character platforming and the other shooting feels completely unnecessary. Most of the time the two are completely separate, with Angel standing still while Rose shoots the enemies. When it is essential to run and shoot at the same time, the mechanic just feels unwieldy. The Enemies: Aside from lacking variety, the enemies in Eternity's Child are a bit on the stupid side, especially the giant mechanical birds, who are a major threat until you realize that simply moving back past their activation point sends them back to their starting position. Move forward, shoot, move back, repeat. Level Design: While the levels in Eternity's Child are beautiful, they seem to favor chaos more than order. Timing jumps can be a chaotic affair, while platforms in one particular level had no real sense of timing at all, causing me to sink into the ocean again and again until I was ready to strangle someone. At times I enjoyed the challenge; other times I felt I was being screwed by poor design choices. It's important to note that Eternity's Child is still very much a work in progress, despite its status as a Steam release. Just yesterday the game was patched to make the giant bird enemies die a little easier, and Luc has informed me that more changes are on the way – removing the Destructoid robot, adding new achievements, and possibly getting rid of the particularly sadistic roller coaster level, which had me shouting curse words I hadn't used in years. It's nice to see the team actively tweaking the title, though I'm not sure it will be enough to reconcile the clashing of excellent artistic design versus sub-par gameplay. Eternity's Child does have a lot to offer for $5 – beautiful graphics, enchanting music, and a level editor to muck about with – all it's lacking is solid gameplay to complete the package. 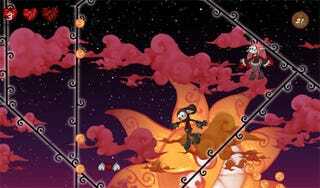 Eternity's Child was developed by Luc Bernard and Silver Sphere Studios, published by Silver Sphere Studios. Released on July 31st on on Steam. Played game to completion.